With the deaths of police officers and civilians fresh on people’s minds, security — both as it affects the Jewish community and its impact on the broader society — was front and center as the New Jersey State Association of Jewish Federations gathered in Scotch Plains for its annual meeting on July 12. For both the guest speakers and those representing the organization, the focus was on that very goal and the urgent need to build bridges between different communities. In that context, executive director Jacob Toporek said, the Jewish community’s commitment to tikun olam, the ideal of repairing the world, is taken very seriously by the state’s leaders. The keynote speaker was Paul Fishman, U.S. attorney for New Jersey, who said he felt compelled to jettison his intended remarks to focus on the tragic events of the previous week that have cast a troubling light on the legal and law enforcement systems in the state and across the country. He stressed both the “hard and dangerous” nature of police work and the need to understand “the plague killing hopes and lives and dreams, particularly of young black men.” Quoting Dr. Martin Luther King’s statement that “we fear each other because we don’t know each other,” Fishman said dialogue is needed to break the “self-defeating cycle” of distrust and violence that is costing lives on both sides. As massive as the problem is, Fishman said, there has been progress. He described his office’s prisoner re-entry work — an “amazing” program that has had incredibly good results helping released prisoners find work and homes, rather than finding themselves forced back into law-breaking to survive. He talked too of the effort to reform the Newark Police Department, and “Operation Safe Streets,” a crime prevention and ceasefire campaign designed to go beyond “catch and incarcerate” policing. Another angle on current problems came from Chris Rodriguez, director of the NJ Office of Homeland Security and Preparedness. While there had been no specific cause for alarm in New Jersey since the Dallas shooting of the police officers the previous week, he welcomed increased funding to deal with threats that might arise. He announced that the state has received a $4.26 million federal grant for hardening security around religious facilities, double last year’s appropriation. He said the money will be distributed in the fall. He also mentioned that the federal Department of Homeland Security is making available $10 million through its 2016 Countering Violent Extremism Grant Program. For the first time, nongovernmental organizations will be eligible for DHS funding to promote community resilience through locally based programs, working with DHS and the Federal Emergency Management Agency. A surprise guest at the event was Lt. Gov. Kim Guadagno. Her comments were to have been delivered in writing, but she said she felt compelled to attend in person because of her close relationship with outgoing State Association president Levenson and his family. Gordon Haas of Elizabeth took office as the new president of the State Association, succeeding Levenson, who held the position for three years. In addition to serving as executive director of the Elizabeth Destination Marketing organization, which promotes tourism to the city, Haas is founder, president, and CEO of the Greater Elizabeth Chamber of Commerce. He serves on the board of the Jewish Federation of Greater MetroWest NJ, was chair of its Community Relations Committee, and before that headed up the CRC of the historic Central federation. He has served as treasurer of the State Association. “Challenges will be met head on. That’s what we do,” Haas said. 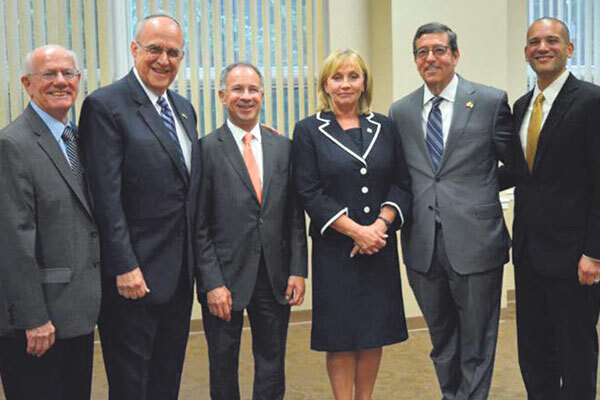 He cited several association endeavors, including its recent successful advocacy efforts in advance of the NJ legislature’s vote to block investments in companies that support the anti-Israel boycott, divest, and sanctions movement, as well as programs addressing security threats and other problems facing the community. The evening included a “Presentation of Appreciation” to Melanie Roth Gorelick, the former director of the GMW CRC. In that capacity, she worked closely with Haas, who served as its chair, and for many years with the State Association. Roth Gorelick, who lives in Livingston, is now vice president of the national Jewish Council of Public Affairs. She had been on the Greater MetroWest federation staff since 2006, leading — among numerous other projects — the NJ Coalition against Human Trafficking and the Step Up for Israel advocacy program, and running a statewide Stop Iran Now campaign. She was the co-convener of the NJ Coalition Responds to the Crisis in Darfur. In 2014 she received the JCPA Program Excellence Award, and the Human Rights Institute at Kean University named her its Outstanding Human Rights Community Activist of the year.